In line with today’s theme, let me give you Emotions by Bee Gees. I’m sure my opinion is not a popular one. But I can’t help it, can I? And I can’t just shut up either. I am (un)fortunately “born this way” as Lady Gaga puts it. 2 – Selling while on duty- look at the uniform? 3 – If not during work hours, why wear the uniform? This is corruption at the lowest level. Not quite different from teachers selling tocino to his/her students, or making students “like” a Facebook photo as homework. I heard of a teacher in Palawan who proudly claimed she was making her students bring empty shampoo sachets, because she could exchange it for something else at the local supermarket, thank you very much. Obviously, in their minds, they are not doing anything wrong. Now , let’s get to know this cop. 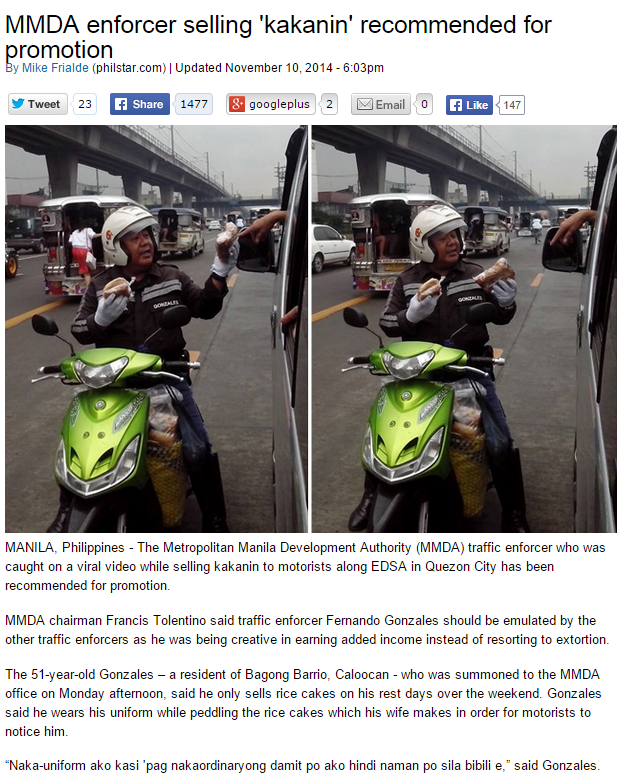 His name is Mr. Fernando Gonzales,a 51-year-old traffic enforcer and a resident of Bagong Barrio, Caloocan. 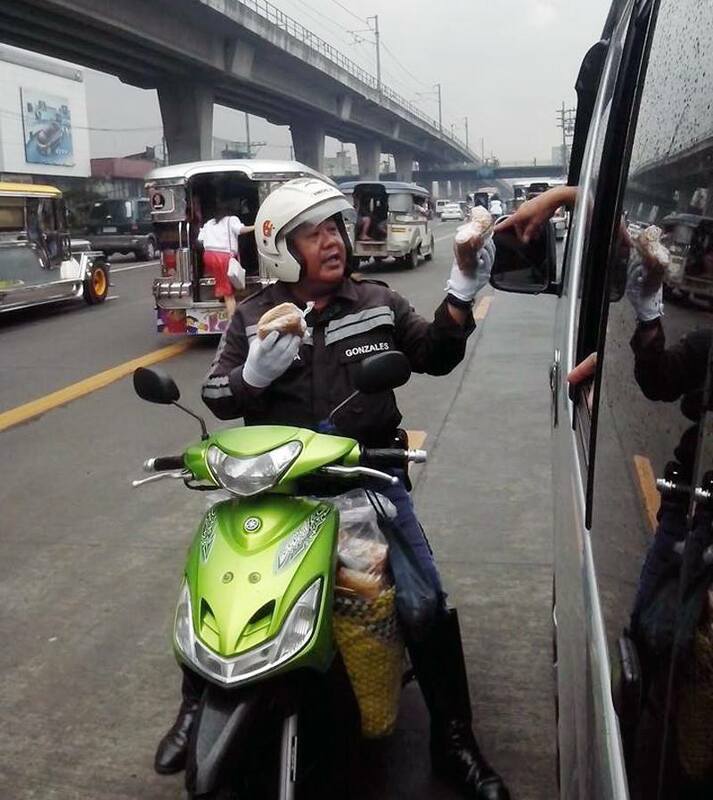 “Actually po hindi ko naman po iyon sinasabay sa trabaho. During day off lang po Tuwing Saturday at Sunday lang po. Monday to Friday puro trabaho lang po yun. Wala po akong iniisip nun kung hindi mapaluwag lang po yung trapik. Kaya naman po ako nagtitinda para po makatulong sa aking may bahay, sa aking mga anak sa kanilang pag-aaral. Nung sinabi po ni misis na marunong siyang gumawa ng kakanin naisip ko po na baka pwedeng magbenta po ako,” said Gonzales. Gonzales said he has to earn extra to support the education of his sons Christians who is now a college freshman and Joseph, a third year high school student. Gonzales said he only earns P15,000 a month. Now we know what’s going on. Fine. He sells only on the weekend. But why the uniform then? I related this to my husband – trying not to inject my own opinion first (just to see how he’d react). It cracked him up. Because it’s obviously an abuse of power and the people- including Mr. Gonzales, don’t seem to know it. This is what I like about him – his level-headedness and his tendency to separate judgement from emotions. He defended Nello’s landlord, for being cross with his un-paying tenants and kicking them out. Now, he believes Mr Gonzales, a loving father trying to make ends meet, is abusing his power! How strange is that! According to history, Hitler never once cheated on his wife. Owen, after, had been inspired by JFK, although the subject of the president’s personal (or sexual) morality would not have dampened everyone’s enthusiasm for his political ideals and his political goals, Owen Meany was not ‘everyone’ – nor was he sophisticated enough to separate public and private morality. 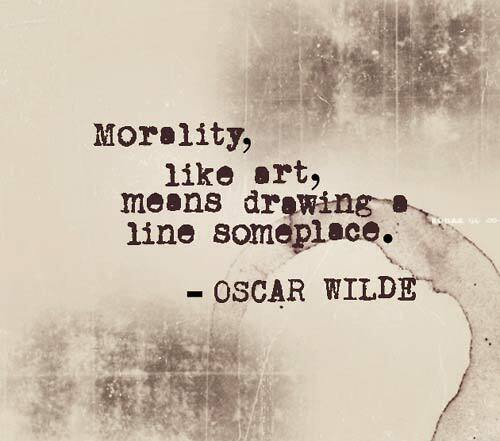 Are you sophisticated (John Irving’s term, not mine) enough to believe that things are not always what they seem? A loving father can be corrupt. A hard-working, underpaid teacher can be corrupt. A faithful husband can be a mass murderer. Japan doesn’t tolerate corruption. 2 years ago, I rented a kitchen at the public hall (yes, they do have some spacious kitchens for rent!!! ) for my cooking lessons and we had a liter of tea unopened. There was no way I was going to carry it back to my house, with all the walking and train changes, so I asked my husband to hand them over to the city hall staff. He said, “They won’t accept it. It can be seen as a bribe.” Who in the world would bribe someone with a $1.50 bottle of tea?! So I tried. True enough, they rejected the bottle of tea! Jesus christ. I rolled my eyes at what I usually call “giant-stick-up-their-asses-ness”. But at the same time, it’s just one of those things about Japan – like using your Smartphone to save your seat in a restaurant and finding it untouched -that really blows my mind!!! But then, you might argue, Japan pays off their public servants decently. Still, I will argue back, does the end justify the means? A couple of weeks ago, two female politicians resigned for unethical behavior bordering on corruption. One of them, Matsushima, was involved in a scandal after distributing fans with her face on it. 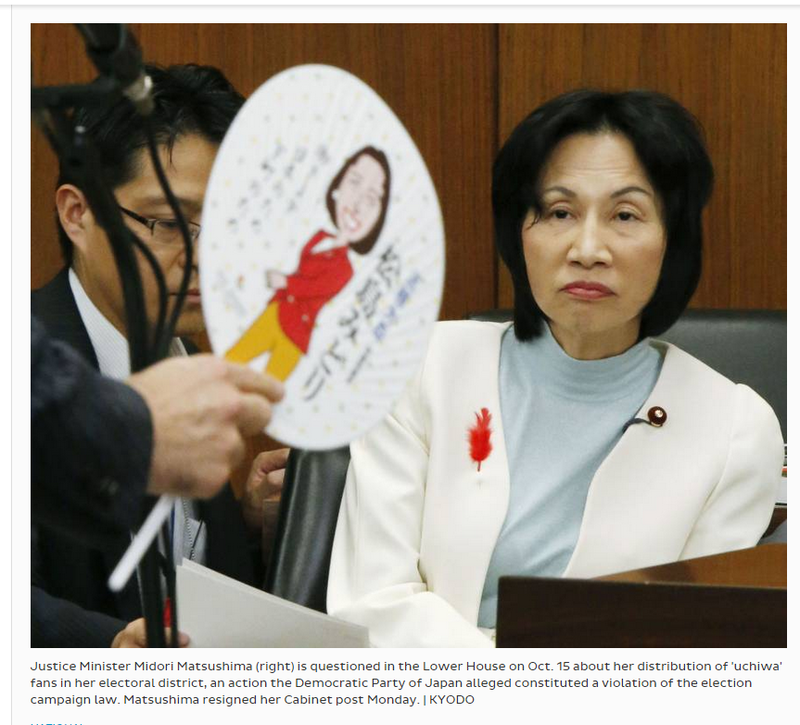 When emotions trump ethics : Matsushima and her fans. Image from the Japantimes. For a fan with her face on it!!! We’ve done worse. In the Philippines, my husband cracked up when we passed by an ambulance with a face on it. Things back home always crack him up. Unfortunately, instead of people voluntarily resigning or getting sacked, we choose to reward them. See, Mr Gonzales is going to get a promotion. For abusing his power. And majority of the commenters on social media actually think he deserves it. It catches people’s attention. They stop because they think they’ve violated a traffic rule. Some probably end up buying for fear of being issued a ticket. I’m just saying. 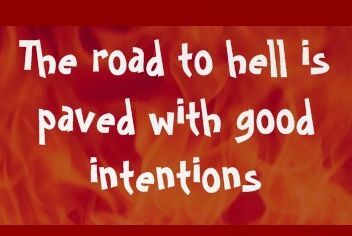 Besides that, it sets a precedence. We’ve given public servants an excuse to wear their uniforms while conducting private business. They can say, “My dad is dying of cancer. I’m just trying to help.” If we promote Mr. Gonzales, then we’re encouraging unethical behavior. I mean we have to draw the line somewhere, right? Not color everything up with emotions! 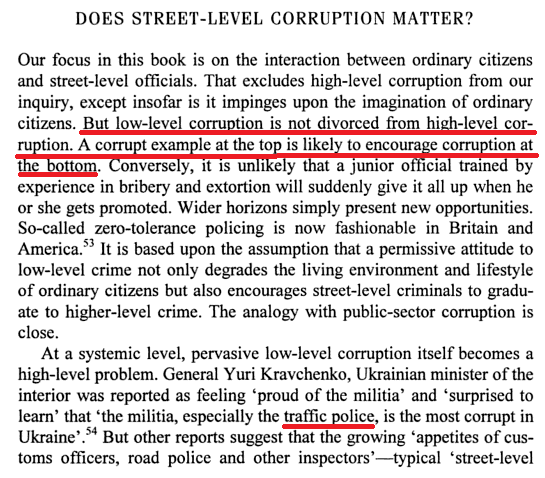 Moreover, if we cannot go after low-level corruption, how can we expect to go after high-level ones? When emotions trump ethics : Does street-level corruption matter? A Culture of Corruption. Coping with Government in Post-Communist Europe by William Miller et al. Reading the comments, I have now proven there is a severe disconnect of how I think to how people back home think. And I’m not even trying to, as the Apple slogan goes, “think different“. It cracked him up. It cracks him up how we Filipinos are. What do you mean with the sentence “Hitler never once cheated on his wife”. Never mind answering, I know it is in the article. I brought it up because apparently you’re very excited about the quality of your husband to separate judgement from emotion. This admired quality of your beloved Japan came in very handy when bombing Pearl Harbor, by murdering all those people on the Birma railroad. Not to mention all the abuses in the Philippines. A little modesty on the so called moral superiority of Japan in comparison with the Philippines is at place. Yes, you might be technically right, it is a form of corruption. But what would you do when when your kids die of hunger. Or when you don’t have for their schooling. Not everybody is in the position to run of abroad! I know you are. But apparently only when criticized. When you are praised you write halve an article. It is about time you pick up some of the better qualities in Japan. 1) ad hominem – criticizing the person is *always* uncalled for. Speaks more about the attacker than the person. 2) Stick to the topic – Pointing fingers, yes, the mature way to solving problems! Not one country/person is completely pure, if we resort to mud slinging it’ll never end! 3) Redundancy – there’s nothing I’d like to add. I don’t want to repeat myself. Everything I want to say is in the post. I’ve given my two cents. Take it or leave it. See, Mr Pinoy puti, I never insulted you or your person. And when I refuse to mud-sling, you berate me. There is no making you happy. I thanked you and I’ll still thank you. Have a good night and more power to you. 1. Critizising a person is acceptable when that person shows very little respect for people replying to her article. When you wrote; damn im lazy. You showed no respect for someone who tried to comment on an article you brought in this world. 2. In your blogs you made it your task to criticize just about everything and everybody with a preference to put down your own country and countrymen. That’s ok, but if you do, accept criticism. 3. I read all your blogs and the comments. You are happy to be praised but don’t take criticism easely. 4. When you write blogs you should always expect reactings from others that don’t agree to you point of view. 5. I never did insult you. I did not scolded you. If you feel insulted, i am sorry to hear. I am not mud slinging. If you stand an opinion, stand by it, accept criticism, think about and if needed, adjust. 6. What annoys me in your blogs is that you lack compassion and empathy with the ordinary Pinoy in their daily strugle for life. Now if that insulted you, so be it. 1) See. we disagree. For me, the end doesn’t justify the means. For you, it’s ok to criticize the person when you feel it’s justified. We have different values. You are not going to change, regardless of what I say. And neither am I. So what’s the point? So I say thank you for your comment and I mean it. 2) Of course I criticize everything – this is why it’s called “rants”. If you read my Japan blog, I criticize Japan too- endlessly. So what? It’s my outlet. You don’t like it, don’t read. I am not forcing you to read. No one is. 3) Since when did I not take criticism easily? Most of what I do is thank commenters. That’s it. Is thanking the person a proof of “unhappiness”? Because I don’t remember criticizing the person – why? Because it’s not justified, in my view. Pls point and show a concrete example at my “unhappiness” at being criticized. 4)Listen to yourself. Your tone.It’s condescending. And it’s what gave you away – the type who has to win. Fine. You win. 5) Lack of compassion – yeah, you know me right? Go ahead, judge me. Because it’s justified, right? Have a good night and again, thank you for the comment. This entry was posted on November 13, 2014 by ikalwewe in Uncategorized and tagged behavior, binbingka, corruption, fernando, gonzales, kakanin, low-level, morality, street-level, traffic, unethical.